15 Business Loops remain active from Interstate 94 across Montana, North Dakota, Minnesota and Michigan. Business Spur I-94 connected the Interstate to the Treasure County seat and old U.S. 10 via Exit 67. A 2016 visit to the town revealed no signs for the route. The former 2.6 mile business spur is a part of Montana 331, but that route is not signed from the I-94 mainline. The secondary highway otherwise follows Buford Street along the east side of the Hysham street grid and old U.S. 10 west to Myers. 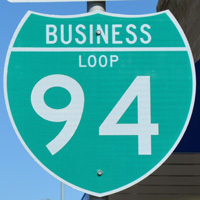 Business Loop I-94 served the city of Forsyth via old U.S. 10 (Front Street) between Exits 93 and 95. No signs were posted for the route in 2016. The city business district is located two blocks north of the former route across the Union Pacific Railroad tracks on Main Street. 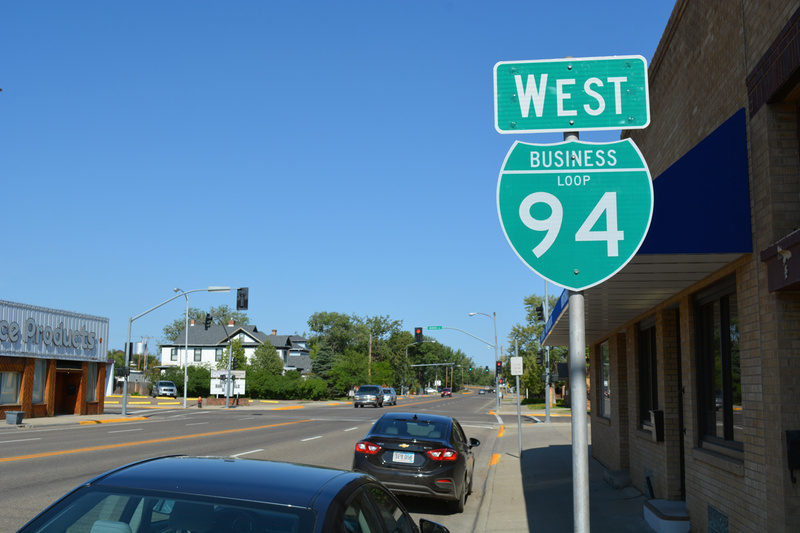 The Miles City Business Loop is well signed, traveling along a combination of Main Street through the city center and Valley Drive East along a portion of old U.S. 10. Business Loop I-94 forms a 6.9 mile route north of Interstate 94 between Exits 135 and 141. The route was well signed during a visit in 2016. 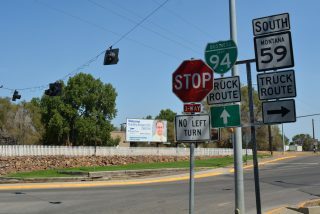 A 6.9-mile long route between Exits 210 and 215, Business Loop I-94 connects I-94 with an array of services at West Glendive and Glendive. The route follows portions of old U.S. 10 along Towne Street and Merrill Avenue through the Glendive city center. Paralleling the route across the Yellowstone River to the south is the Bell Street Bridge, an old U.S. 10 truss bridge repurposed as a pedestrian span. Signs for this business loop were consistently posted as of 2016.
Business Loop I-94 in Downtown Glendive. 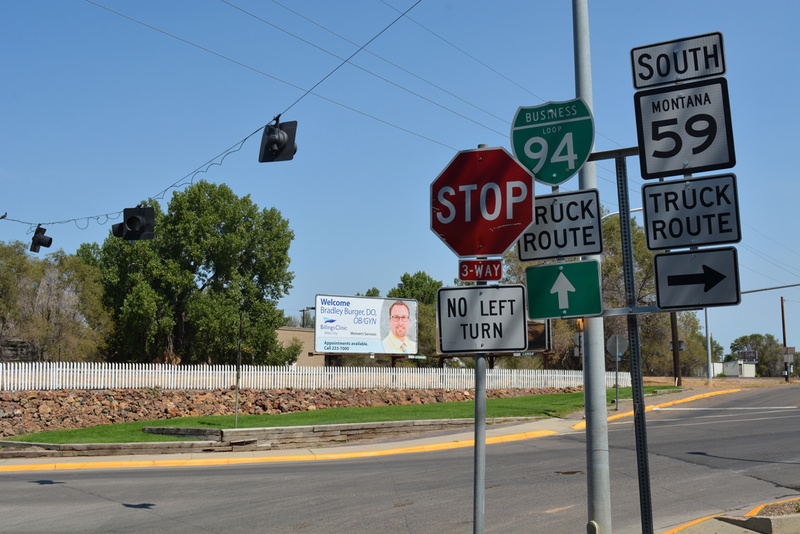 Wibaux was served by a mile long Business Loop between the half diamond interchanges of Exits 241 and 242. The route followed 2nd Avenue (old U.S. 10) along side Montana Secondary 261 east to Wibaux Street and Montana 7 east from there to I-94. A drive through the town in 2016 showed no signs for the route. A wye interchange (Exit 27) brings Business Loop I-94 and old U.S. 10 back onto Interstate 94 at the east end. Construction of the freeway replaced the old route to the Painted Canyon Visitor Center and 36th Street SW, just west of Exit 36. The Medora Business Route was posted with just one sign per direction in 2016. The city of Dickinson sees a 5.3 mile route for Business Loop I-94 between Exits 59 and 64. The west end of the loop serves a growing big box retail area, a hospital and apartments as it leads southeast from I-94 to overtake old U.S. 10 along Villard Street. 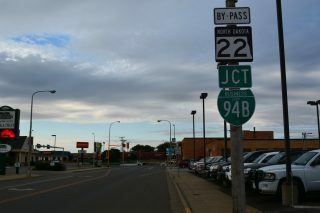 Villard Street runs east to the city center, where Business Loop I-94 intersects ND 22 (Main Avenue). East from there, the business route branches northeast from Villard Street along side former U.S. 10 back to I-94.Business Loop I-94 in Dickinson was well signed during a visit in 2016. One of the longer Business Loops in the system, the Mandan and Bismarck route for I-94 stretches 17.4 miles from rural Exit 147 to an industrial park area at Exit 161. The Morton County portion of Business Loop I-94 stems south from I-94 and ND 25 to overtake old U.S. 10 east into the city of Mandan. The route follows Main Street through the city center to Memorial Highway, which parallels a BNSF Railroad line southeast to Interstate 194 and the Memorial Bridge across the Missouri River. The Burleigh County section of Business Loop I-94 lines old U.S. 10 along Main Avenue through Downtown Bismarck, ten blocks south of the state capitol. The route turns north from old U.S. 10 and returns to I-94 via the easternmost segment of the Bismarck Expressway (unsigned ND 810). The two-county route is well signed and is the designation posted for the short I-194 spur from Exit 156 south to the Bismarck Expressway. Well, it's about as close as you can get to seeing an I-194 shield in North Dakota. A few guide signs for the business route remained along the I-94 mainline as of August 2016. The former route traveled 3.9 miles from a wye interchange (Exit 257) with old U.S. 10 east to a folded diamond interchange (Exit 260) adjacent to a BNSF line on the east side of the city. The route combined with U.S. 52 & 281 northeast to cross the James River at 10th Street and the city center. East from there, Business Loop I-94 turned south along 12th Avenue SE to join “Business Loop East” back to I-94. Sign bridges posted along U.S. 52 & 281 showing the Business Route were greened out or replaced with overheads for “City Center”. A 4.4 mile long route, Business Loop I-94 through the Barnes County seat follows old U.S. 10 & 52 (Main Street) between Exits 290 and 294. The route was fully signed during a visit to Valley City in 2016 with an array of services west from the city center and a historic arch bridge across the Sheyenne River. Cosigned with U.S. 10 on the western half and formerly Minnesota Trunk Highway 231 on the eastern half, this 12.6 mile route joins Downtown Fargo with the Moorhead city center and Bonanzaville USA in West Fargo. The business route emerges from I-94 at a trumpet interchange (Exit 343) on the outskirts of West Fargo and follows U.S. 10 (Main Avenue). Main Avenue also represents former alignments of U.S. 52 and U.S. 10S. The route through West Fargo was redesigned from a industrial style arterial with frontage roads to a landscaped boulevard in stages from 2009 to 2016. Completed redesign of Main Avenue at the western terminus of US 10. Work east from the Sheyenne River to Drain 21 continues. East into the city of Fargo, Business Loop I-94 & U.S. 10 expand into a six-lane divided arterial leading to and from Interstate 29 & U.S. 81. Differing from the retail strip along 13th Avenue to the south, this stretch of Main Avenue is more industrial with machine shops and hardware stores more prevalent than restaurants and other retail, though some of those front the route as well. The Veterans Memorial Bridge spans the Red River into Moorhead, Minnesota, with Business Loop I-94 & U.S. 10 remaining on Main Avenue to U.S. 75 (8th Street) in Downtown. U.S. 10 branches north from there with U.S. 75 en route to Dilworth while Business Loop I-94 turns southeast toward Interstate 94 along SE Main Avenue. The SE Main Avenue section used to be Minnesota Trunk Highway 231, which was turned back to the city during the 1990s. The lone business route for Minnesota previously ended at a folded diamond interchange (Exit 2) with CSAH 52. Construction in 2010 relocated the route along a dogleg using 24th Avenue S and the 34th Street S extension to a new interchange (Exit 2) with I-94. The former exchange with Main Avenue SE and CSAH 52 was slated for removal, but restored as a half diamond interchange in 2011 at the urging of local businesses. Field verified in 2015, one benefit of the relocation was the installation of new signs for what was otherwise a poorly signed route leading north from I-94. Business Loop I-94 stems north from Exit 23 along Red Arrow Highway (old U.S. 12) to the village of Shoreham. The trunk highway straddles coastal areas of Lake Michigan northeast along Lakeshore Drive into the city of St. Joseph, where it connects with Main Street and M-63 through Downtown. The couplet of Ship Street east and Port Street west lead Business Loop I-94 away from M-63 (Main Street) to Wayne Street across Morrison Channel and Radio Island. The bridge across the St. Joseph River brings Business Loop I-94 into the city of Benton Harbor. Main Street takes the route east through Downtown, one block north of City Hall. M-139 used to overlap with the business loop between Paw Paw Avenue and Martin Luther King Drive. The trunk highway now travels south from Main Street only. Business loop I-94 transitions into a freeway east from Urbandale Avenue. 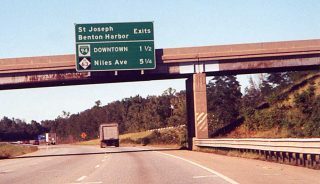 The highway concludes a 10.76 mile route2 at a trumpet interchange (Exit 33) with I-94 at Benton Heights. The Kalamazoo business route forms an 11.21 mile2 arc north from Exits 74 and 81. The trunk highway overlaps with U.S. 131 north to Stadium Drive from Exit 36. Stadium Drive ventures east along side U.S. 131 Business to Western Michigan University. Michigan Avenue takes over the trunkline highway between Waldo Stadium and M-43 (West Main Street). M-43 combines with the two business routes as they separate into a couplet along Michigan Avenue east and Kalamazoo Avenue west. Michikal Street connects the westbound direction of Business Loop I-94 with Michigan Avenue to the south. Once in Downtown Kalamazoo, U.S. 131 Business splits for the one-way pair of Park Street and Westnedge Avenue. The separate directions of Business Loop I-94 & M-43 otherwise recombine ahead of the Kalamazoo River, where the two part ways. Business Loop I-94 angles southeast along King Highway to intersect the west end of M-96. M-96 continues King Highway east while the business route shifts onto an expressway back to Interstate 94 at a wye interchange. Business Loop I-94 in Battle Creek follows old U.S. 12 along a 13.95 mile2 alignment from Exit 92 east to Exit 104. The initial stretch runs concurrent with M-37 along Columbia Avenue and Skyline Drive to the west of W.K. Kellogg Airport (BTL). The tandem combine with M-96 along a one mile stretch of Dickman Road along the north side of the airport. M-37 leaves Dickman Road for Helmer Road north followed by the departure of M-96 via Helmer Road south. This leaves Business Loop I-94 to continue solo on Dickman Road east to the Battle Creek central business district. Business Loop I-94 crosses paths with I-194 & M-66 east of Lower Pond. A convoluted route ensues east from there along Main Street northwest, Hamblin Avenue northeast and Michigan Avenue southeast. Business Loop I-94 (Michigan Avenue) ventures east to combine with M-96 (Columbia Avenue), with the two overlapping to M-311 and Interstate 94. Direct ramps between Business Loop I-94 east to I-94 east and from the freeway west to Michigan Avenue were removed between 2008 and 2011. Interstate 94 bypasses the north side of Marshall between I-69 (Exit 108) and Exit 112. A 5.52-mile2 long business route loops south to the city via Interstate 69, Michigan Avenue (old U.S. 12) and Partello Road. Business Loop I-94 travels south from Exit 121 and C Drive North along Eaton Street to Austin Avenue in Albion. Austin Avenue (former U.S. 12) leads west as M-199 to Marengo while Business Loop I-94 overtakes the last two blocks east to connect with Superior Street. Superior Street continues the business route south to Downtown and M-99 (Michigan Avenue). Interstate 94 runs along the north side of Jackson with a series of six interchanges serving the city. Business Loop I-94 originates along a freeway (M-60) by Jackson County Airport (JXN) at Exit 136. M-60 overlaps with the route south to Michigan Avenue, where Business Loop I-94 joins the former U.S. 12 east. U.S. 127 Business & M-50 tie into Business Loop I-94 (Michigan Avenue) from West Avenue. The trio proceed east to encircle Downtown Jackson along a one-way loop consisting of Washington Avenue east, Cooper Street north, Michigan Avenue west and Louis Glick Highway west. U.S. 127 Business & M-50 turn southward on Cooper Street as Business Loop I-94 resumes east along Michigan Avenue between the Grand River and the U.S. 127 freeway. The final three miles of the 11.5-mile loop2 follow Ann Arbor Road northeast to Exit 145. Interstate 94 curves southeast around Ann Arbor between Exits 171 (M-14 freeway) and 180 (U.S. 23 freeway). Business Loop I-94 bisects the city east from Exit 172 along Jackson Avenue and Huron Street (old U.S. 12) to Downtown. U.S. 23 Business accompanies the route from Main Street east to the University of Michigan, where the pair turn south and southeast along Washtenaw Road. Washtenaw expands to a commercial arterial ahead of the cloverleaf interchange with U.S. 23 (Exit 37). U.S. 23 Business ends there as Business Loop I-94 merges with the freeway south to Interstate 94.
Business Loop I-94 was established by 1987 with 8.81 miles2 over the trunkline highway of M-25 north from Exit 266 to the Bluewater Bridge (I-69 & 94) at Exit 274. Gratiot Boulevard angles the business route northeast along a commercial arterial from I-94 to M-29 (Busha Highway) within the city of Marysville. The trunkline highway proceeds north along the St. Clair River from there to separate into a couplet of Military Street north and Electric Avenue south through southern Port Huron. The one-way pair of Business Loop I-94 converges at Vanderburg Place as Military Street. The route advances north 0.7 miles to merge with Business Loop I-69 at Oak Street. Business Loop I-69 follows Griswold Street west, while the route north overlaps with Business Loop I-94 to Downtown via Huron Avenue and M-25 via Pine Grove Avenue. -Info-Dept. of Transportation. “RE: NDDOT Question.” Message to webmaster at aaroads.com. 23 August 2016. E-mail. Michigan Highways: Business Connections 32 through 94. Center Avenue north at the intersection where Business Loop I-94 (Valley Drive East) east and Montana 59 (Main Street) south part ways in Miles City. A truck route is posted for the Business Route to circumvent Downtown. Black and white shields were formerly used to mark the route as well. See our Blog for a photo. Photo taken 08/07/16. June 2016 installed shield assembly posted along North Dakota 22 (3rd Avenue West) for Business Loop I-94 (Villard Street) in Downtown Dickinson. New signs for North Dakota state highways began appearing throughout the state in 2016. Photo taken 08/07/16. 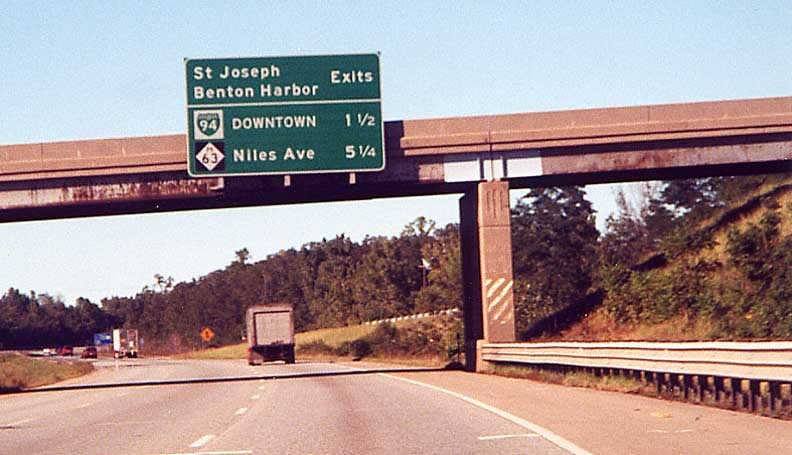 This community interchanges identification sign posted within Exit 22 was the first reference of the St. Joseph and Benton Harbor, Michigan business loop from I-94. It was removed by 2008. Photo taken by Marc Fannin (2000).